Sunday lunch is at our home today. That means I'll be inundated with 15-20 in-laws. We used to do this often, but fell out of habit when Kathy's knee worsened. Kathy's family has met for Sunday lunch and special occasions all her life: at her grandmother's, at her mother's, and now here or next door at Kathy's sister's home. Until my sister-in-law built next door, we hosted the special occasions here. Now it is a shared thing, more her than us lately. The menu: oven-fried white chicken, baked potatoes, corn, taco salad, deviled eggs, hot rolls, fruit salad, chocolate cake, and ice cream. I'm celebrating today. Yesterday, I finished a long term project, the black iron fence around the pool. It has taken two years to complete. I started the project by setting all the posts. Then there was a nervous interval while I waited the laying of the concrete. I was relieved when the iron rails all fit between the posts, no mistakes there. The last two of the four gates were a problem. They had to be wider than the standard ones because they spanned an existing sidewalk. The plan was to purchase gate hardware and build my own. However, between the time I made the plan and when I was ready for the gates, the company stopped offering the kits. Standard gates would leave a six inch gap in the fence. I puzzled over how to fill the gaps for several months. It was too small for a rail segment and too large to skip. My eventual solution was to buy the ready-made gates and additional posts, then fill the remaining gap with three sets of washers that I'll eventually paint black. I hung the gates from the barn side. That required additional bracing inside the garage. Yesterday was my turn to cook lunch. 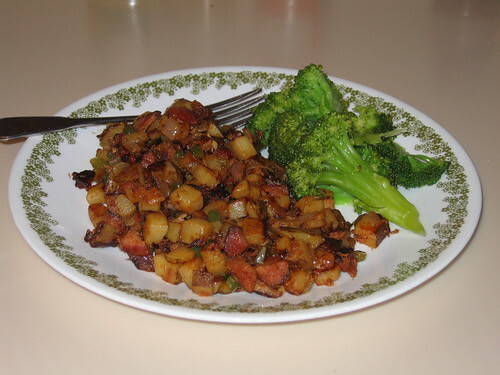 I made hash using a bit of smoked pork.